Thought Wagon Design Studio | Where work meets play and passion brings out creativity. Take a look at some of our works. We conceptualize, develop and create original character designs and illustrations that specifically match the personality and identity of companies and brands, as well as the message they want to communicate. We work hand-in-hand with different companies and individuals in creating professional and effective logos, as well as business card, letterhead, envelope and stationery designs. We specialize in creating fresh, creative and effective artworks for in-store merchandising and promotional materials, product dispensers and displays, packaging materials, printed and online advertisements, convention and sampling booths, and promotional giveaways. Thought Wagon Philippines is a graphic design studio born from a shared love for art and marketing. We love what we do. We love our clients, our brands and our works. China graduated in 2008 with a degree in BS Management. She worked as a Brand Assistant for the biggest pharmaceutical company in the Philippines until she joined Thought Wagon Design Studio in 2010. She loves traveling, playing video games and hanging out with her pet bunnies. Carlos graduated in 2008 with a degree in BS Management. 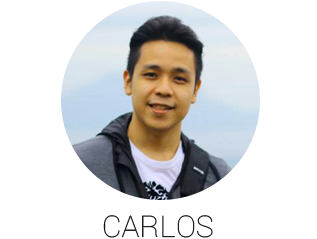 He worked as a Marketing Assistant for one of the top corporations in the Philippines until he founded Thought Wagon Design Studio back in 2009. He enjoys drawing, people watching, and going on long road trips.